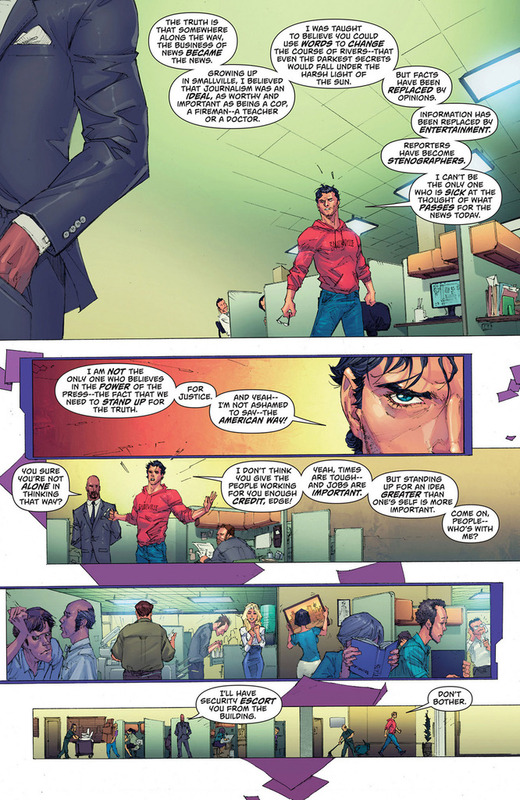 scans_daily | Superman #13: Clark Leaves The Daily Planet. Aside from everything else, putting fellow employees on the spot like that doesn't really feel like the Superman thing to do. I would put it as Clark, being human, was frustrated with the state of things enough that he just did it before thinking. As he's flying away to see what he's hearing in that final scan, he asks himself if what he did in the bullpin was right. Superman rallying people he counts as friends to face something he feels strongly about, sounds like a very Superman think to do. I don't know, frankly that panel of the Daily Planet employs comically busying themselves like they don't all loathe Edge and don't agree with Clark doesn't endear me to them at all. In fact, it makes them look like cowards. Was the last panel with Cat Grant drawn by Liefeld? Is she keeping her intestines in her breasts? Rocafort i think, but yeah, that is the one panel that made me go "OUCH!" i mean it's not nearly as bad as atrue Back Breaker, but pretty damn close. I think it works if we consider her to be a VERY petite woman, but yeah, it kinda pushes it. That is definitely something about Rocafort that is a bit of a problem, in that he exaggerates the female form pretty hard. I can accept it in characters like Starfire, but it looks weird when it's done to the regular people like Cat. also That panel with Kat was "ouch"
Swim trunks nothing, those looks like his Kryptonian overpants. Poor guy must be wearing them under the suit to try to hide them from the kewl patrol. I mean, I'd prefer that this not be the case at all, and for him to sense touch more or less normally. But if we're going in this direction, I want it limited; frankly, a Superman with no sense of touch would be incredibly dangerous. *Mind out of the gutter, icon_uk! Okay, how did Clark -not- know that the shower was occupied? HE HAS SUPER HEARING, he can hear a mugging being committed more than 100 miles away! And yet, he's totally oblivious to a shower running less than 5ft? I can't decide if Clark is a terrible roomate or Jimmy is a terrible hookup. First, Clark walks in on his roomate gettin' down in the shower and just sort of stands there lecturing him while just... watching, I guess. Then Jimmy leaves his hookup to continue this conversation with Clark? What the hell, what is she, chopped liver, guys? Little respect. I'm no expert on English culture, but in England, aren't "the tabloids" conisdered respectable journalism? Thus, entertainment is the news, at least over there. Maybe someone who knows more about English journalism can set me straight. As far as reporters becoming stenographers, well, that depends on what they cover. Well, the tabloids include what I'd call the gutter newspapers over here, such as the now (thankfully) deceased News of the World, The Daily Star, Daily Mirror, and the Sun. There are several slightly more respectable tabloid newspapers, such as the Times, but otherwise, tabloid journalism doesn't entirely have a brilliant name at the moment, partially because of the rather astonishing phone-hacking scandal, and from what I understand, 'tabloid journalism' was never considered to be that respectable a term in the first place. When I first heard about this, I thought that while Superman is idealistic, morally upright, and says the truth no matter what, he says it as Superman, not when in disguise as the "mild-mannered reporter, Clark Kent." 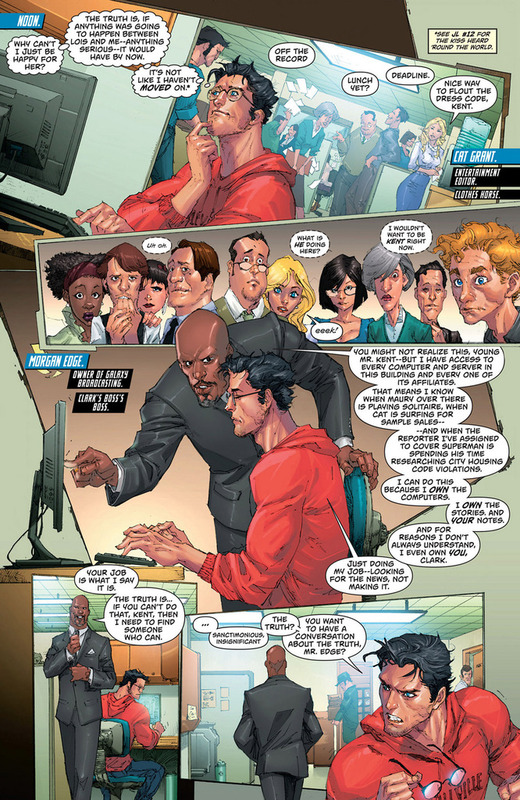 However, having looked at the scene in question and seeing Clark deliver his "fire sermon"/"Jerry Maguire" moment on the sorry state of modern journalism while having his characteristic Clark Kent glasses off, the symbolism is all-too obvious: even though he's supposed to be "in disguise as Clark Kent" in the context of the scene, it's really Superman on the soapbox. Course, this also means, looking past the symbolism, that Clark essentially revealed his secret identity, except no one seems to notice how he looks so much like Superman without his glasses in the scene. Oh, and you know which other character could have also and should have delivered this "fire sermon?" Lois Lane, someone whose defining traits are supposed to be all about finding the real story, getting down into the trenches and exposing the truth no matter what the cost. But in this issue? 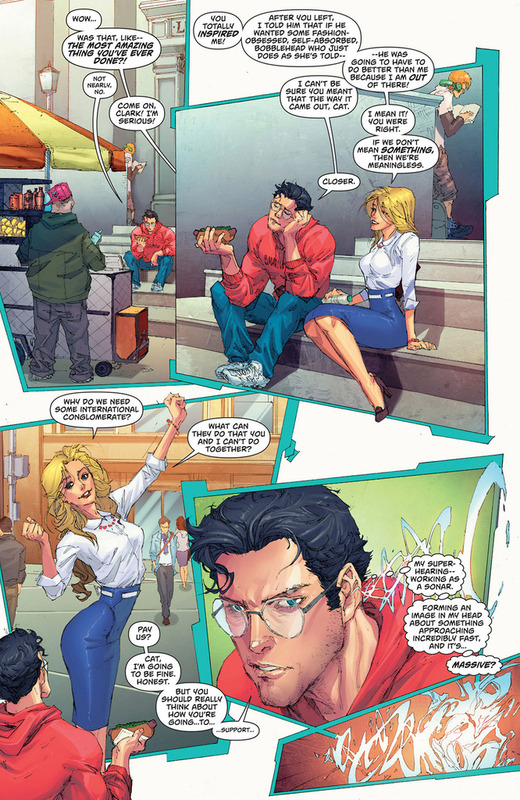 Not only does Lois appear to actually advocate the current business practices of the Daily Planet to sensationalize news (to which Clark chastises her for favoring fluff pieces in the TV news division she now produces) but she seems more interested in responding and sending flirty text messages to her new boyfriend than what Clark actually has to say. In other words, what Lobdell has done is give Clark the very characteristics Lois is supposed to have and which has defined her as a character for over 75 years. It's one thing to emphasize Clark's idealism, but quite another to tear down other characters, especially an important supporting character like Lois, in order to prop him up. Well, I haven't read Superman post reboot, so it's hard for me to judge, but it appears that Lois is making a leap in her relationship. So it wasn't so much that she was being 'flirty' as she was confirming her change of course to her boyfriend. Also, and again I'm reaching because I haven't read Superman aside from the glimpses here, it sounds like Lois is having a bit of a crisis of character. She's in a new job that takes her away from how she identifies herself. Her boyfriend has been trying to get her to move in with him, it seems, and she hedges at the last second. Perhaps she's re-evaluating her life, trying to make changes to make it more fulfilling. I'm not saying she needs to live with her boyfriend to have a fulfilling life, just that it seems like she might be making drastic changes in her personal life to try to make up for the parts of her professional life she finds less than adequate. 1. Sooooo, Clark's pretty much given up on the secret identity thing, then? Because first we have him walking in on Jimmy with no glasses and showing off his ridiculous physique. And then we have him taking off his glasses while standing up all straight and manly and confident, and wearing a red and blue outfit, and giving an inspiring speech to an entire room of news people who know he's assigned to cover Superman and isn't working too hard at that. It's like he's deliberately testing just how stupid his coworkers can possibly be. I mean, Clark and Supes don't even have different hairstyles now. 2. Clark's being kind of dickish to Cat here. She's the only one who backed him up, and as soon as they're out of the building he's all "You don't understand my vision and you're on your own, good luck as a penniless hobo!" 3. Not having read the issue, I'm simply going to head-canon that that's Lois in there with Jimmy. And tomorrow they'll all be showering together. And Cat's moving in too. I'm delighted to see that I wasn't the only one think that looked like Lois with Jimmy. I'm just... I'm just really happy to see thought bubbles again... I missed them. I'm glad "Cat Grant" is back to being sympathetic, as opposed to the shrew Johns made of the character--the trademark--whatever. At least Clark had job security pre-Flashpoint, seeing as the Planet was bought by his BFF. YOU STILL NEED TO SHOWER TO GET CLEAN. It has to be, because that's the only way to explain how he did surgery, on Lois Lane, with his finger nail in Action Comics issue 12 without her getting some kind of infection. The sad thing is I WANT to get interested in Superman. I really do, but it's just...off-putting. Clark! Clark! What is it that you think stenographers do? If he means it like a Court Stenographer then it would be "Copy down what other people say, without applying your own interpretation or context on what is said." Sounds like a valid criticism of the sort of journalism that Clark is lambasting here; there's no investigation, no application of context or enquiry, simply reporting what other people say. As Truman Capote put it, when asked his opinion of "Valley of the Dolls"; "This isn't writing, it's typing." "You had me at Hello"?